We never sell copies or reproductions of any kind; this photo has been hand-signed by Bill Paxton, Ginnifer Goodwin, Jeanne Tripplehorn & Chloe Sevigny. Bill autographed this picture before his appearance on Late Night with Jimmy Fallon on February 9, 2010. Jeanne signed this photo at the Pierre Hotel after party for the premiere of Grey Gardens on April 14, 2009. 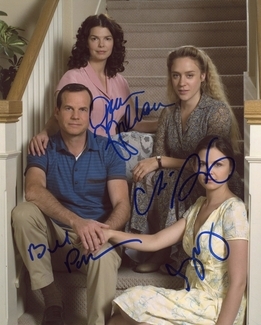 Ginnifer autographed this picture after here appearance on Late Night with Conan O'Brien on February 4, 2009. Chloe signed this photo at the amFAR Fashion Gala at Cipriani's 42nd Street on February 10, 2010.